machinery or equipment and provision of technical support. 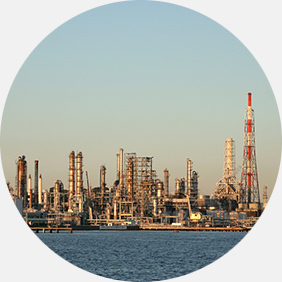 PMC’s major clients are large-scale plants in the fields of oil refining, petrochemicals, LNG, steelmaking, thermal and hydroelectric power generation, gas processing, and fertilizer industries over the world. In response to clients’ requests, PMC supplies optimum parts, machinery and equipment required for plant maintenance, repairs, renovations and expansion, ranging from a single bolt to turbines, pressure vessels, and even sets of large facilities. These parts and equipment are procured from manufacturers in and outside Japan. In addition, PMC offers a range of technical support in an integrated manner, covering periodical technical support, training of maintenance staff, technical guidance, and comprehensive overhaul, rehabilitation and consulting services for energy conservation and environmental protection in cooperation with suppliers and partners in different countries. Let us introduce typical projects PMC has performed in two regions: Asia and Latin America. In Southeast Asia, PMC supplied tens of thousands of spare parts for a two-year period for a thermal electric power plant (total output: 1,200MW). These spare parts were supplied in a package and were accepted under PMC’s responsibility and delivered with necessary documentation to the client. All spare parts have been contributing to successful operation of the power plant. In Latin America, PMC organized the overhaul and repair of a compressor train in a large-scale methanol plant. A thorough overhaul was performed by a number of engineers dispatched from several Japanese firms under PMC’s coordination in order to refresh the equipment. copyright(c) Plant Maintenance Corporation All Rights Reserved.